The Young Adventurer and The Young Miner are a two part series that follows Tom Nelson from a small town in the northeast across the country and through California as he seeks his fortune and tries to save his family from destitution. Horatio Alger was once crowned "America's bestselling author of all time." His works are back and they read like never before. E-books come alive with illustrations, commentary, author biography, study questions and more. 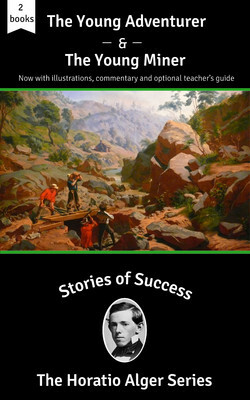 You will fall in love with these stories of success! Also available as individual audiobooks: The Young Adventurer and The Young Miner. Horatio Alger was a prolific 19th-century American author, best known for his many juvenile novels about impoverished boys and their rise from humble backgrounds to lives of middle-class security and comfort through hard work, determination, courage, and honesty. His writings were characterized by the "rags-to-riches" narrative, which had a formative effect on America during the Gilded Age. Alger's name is often invoked incorrectly as though he himself rose from rags to riches, but that arc applied to his characters, not to the author. Essentially, all of Alger's novels share the same theme: a young boy struggles through hard work to escape poverty. Critics, however, are quick to point out that it is not the hard work itself that rescues the boy from his fate, but rather some extraordinary act of bravery or honesty, which brings him into contact with a wealthy elder gentleman, who takes the boy in as a ward. The boy might return a large sum of money that was lost or rescue someone from an overturned carriage, bringing the boy—and his plight—to the attention of some wealthy individual. It has been suggested that this reflects Alger's own patronizing attitude to the boys he tried to help.